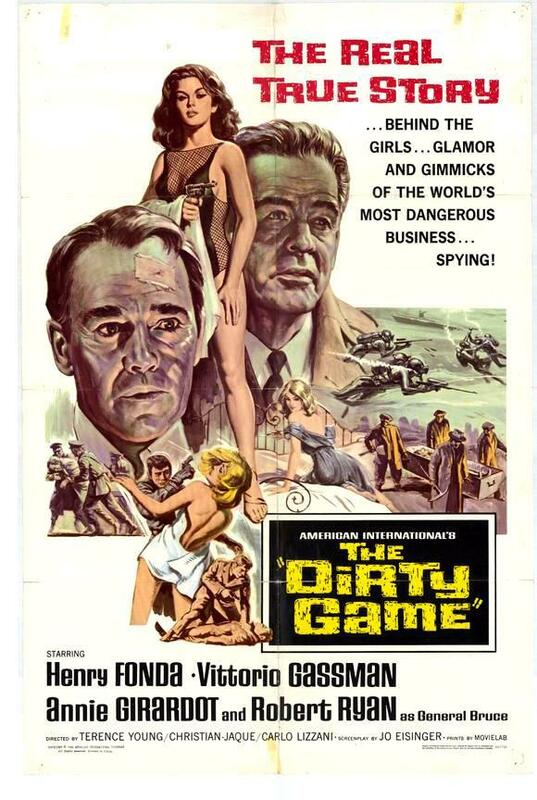 Grossly underseen, The Dirty Game (aka The Secret Agents) is neat little spy film that acts as a counter to all of the spy nonsense of the James Bond craze. It is a solid little film which has intriguing turns by Henry Fonda and Robert Ryan that make the film worth tracking down. Essentially three separate films by three different directors linked by the Robert Ryan character who narrates the film seeks to show what the life of spies is really like. Gritty, down beat and dark the stories are simple but not simplistic. The first story concerns an Italian scientist who has a new formula the various powers want. He is then manipulated toward siding with the US. The second has a spy running down information concerning Polaris submarines. The final story has Henry Fonda as deep cover agent who comes in from the cold and is put in a hotel against his wishes and thus left a target for assassins. There are no super heroics just men and women doing their job. This is more John LaCarre territory and not Ian Fleming. People screw up, are captured and die. While the stories are simple of necessity, this is really 3 short films, they convey the tough life of a spy. We get a sense of the danger which most other films and TV programs never seem to convey. We also get a sense of the action happening across the globe and not one exotic locale. While the film could never be considered the best of it’s kind, it is a damn fine film. It has genuine suspense especially in the final Henry Fonda segment. Fonda is excellent and he makes this final bit work. It is one of the best pieces of work he turned out and the fact that most people have never seen it is a sin.